Astronomers are using the NASA/ESA Hubble Space Telescope to study auroras — stunning light shows in a planet’s atmosphere — on the poles of the largest planet in the Solar System, Jupiter. This observation programme is supported by measurements made by NASA’s Juno spacecraft, currently on its way to Jupiter. Jupiter, the largest planet in the Solar System, is best known for its colourful storms, the most famous being the Great Red Spot. Now astronomers have focused on another beautiful feature of the planet, using the ultraviolet capabilities of the NASA/ESA Hubble Space Telescope. The extraordinary vivid glows shown in the new observations are known as auroras . They are created when high energy particles enter a planet’s atmosphere near its magnetic poles and collide with atoms of gas. As well as producing beautiful images, this programme aims to determine how various components of Jupiter’s auroras respond to different conditions in the solar wind, a stream of charged particles ejected from the Sun. This observation programme is perfectly timed as NASA’s Juno spacecraft is currently in the solar wind near Jupiter and will enter the orbit of the planet in early July 2016. While Hubble is observing and measuring the auroras on Jupiter, Juno is measuring the properties of the solar wind itself; a perfect collaboration between a telescope and a space probe . The strong magnetic field of the gas giant grabs charged particles from its surroundings. This includes not only the charged particles within the solar wind but also the particles thrown into space by its orbiting moon Io, known for its numerous and large volcanos. 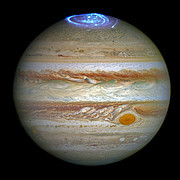 Jupiter’s auroras were first discovered by the Voyager 1 spacecraft in 1979. A thin ring of light on Jupiter's nightside looked like a stretched-out version of our own auroras on Earth. Only later on was it discovered that the auroras were best visible in the ultraviolet. This is not the first time astronomers have used Hubble to observe the auroras on Jupiter, nor is it the first time that Hubble has cooperated with space probes to do so. In 2000 the NASA/ESA/ASI Cassini spacecraft made its closest approach to Jupiter and scientists used this opportunity to gather data and images about the auroras simultaneously from Cassini and Hubble (heic0009). In 2007 Hubble obtained images in support of its sister NASA Mission New Horizons which used Jupiter's gravity for a manoeuvre on its way to Pluto (opo0714a).